We discovered a library jewel in the small community of Fulshear, Texas over the last month or so....a fully staffed library with children's story and activity hour! We took Rheagan to the half hour storytelling and activity session, and stayed for the arts and crafts activity. They have sessions for toddlers and one for older children...very nicely done. It is such a pleasure to find an "old fashioned branch library" (Fort Bend County Library System) with such an array of programs and collections when so many libraries across the nation are closing or reducing programs due to budget cuts. 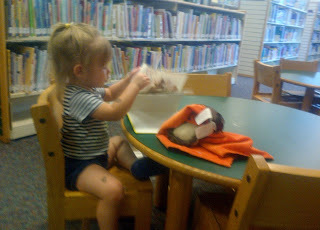 We immediately became Friends of the Library and look forward to many more visits in the future.